(Nanowerk News) Transforming lead into gold is an impossible feat, but a similar type of "alchemy" is not only possible, but cost-effective too. Three Penn State researchers have shown that certain combinations of elemental atoms have electronic signatures that mimic the electronic signatures of other elements. According to the team's leader A. Welford Castleman Jr., Eberly Distinguished Chair in Science and Evan Pugh Professor in the Departments of Chemistry and Physics, "the findings could lead to much cheaper materials for widespread applications such as new sources of energy, methods of pollution abatement, and catalysts on which industrial nations depend heavily for chemical processing." The researchers also showed that the atoms that have been identified so far in these mimicry events can be predicted simply by looking at the periodic table. The team used advanced experimentation and theory to quantify these new and unexpected findings. "We're getting a whole new perspective of the periodic table," said Castleman. The team's findings will be published in the 28 December 2009 early on-line issue of the journal Proceedings of the National Academy of Sciences, and at a later date in the print edition of the journal. Castleman and his team -- which includes Samuel Peppernick, a former Penn State graduate student who now is a postdoctoral researcher at the Pacific Northwest National Laboratory, and Dasitha Gunaratne, a Penn State graduate student -- used a technique, called photoelectron imaging spectroscopy, to examine similarities between titanium monoxide and nickel, zirconium monoxide and palladium, and tungsten carbide and platinum. "Photoelectron spectroscopy measures the energy it takes to remove electrons from various electronic states of atoms or molecules, while simultaneously capturing snapshots of these electron-detachment events with a digital camera," said Castleman. "The method allows us to determine the binding energies of the electrons and also to observe directly the nature of the orbitals in which the electrons resided before they were detached. 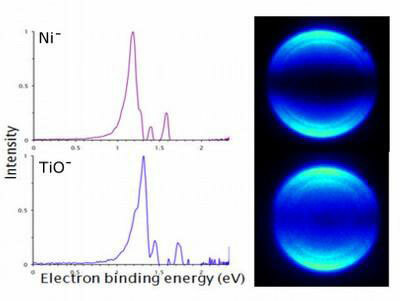 We found that the amount of energy required to remove electrons from a titanium-monoxide molecule is the same as the amount of energy required to remove electrons from a nickel atom. The same is true for the systems zirconium monoxide and palladium and tungsten carbide and platinum. The key is that all of the pairs are composed of isoelectronic species, which are atoms with the same electron configuration." Castleman noted that, in this case, the term isoelectronic refers to the number of electrons present in the outer shell of an atom or molecule. The team looked at images of the photoelectron spectroscopy data. Bright spots in the images, which correspond to the energy of the electrons emitted during their removal from the atoms' outer shells, appeared to be similar between the pairs of species in the three systems studied. Likewise, graphical displays of energy peaks were similar between the pairs, and theoretical calculations also resulted in the pairs having matching energy levels. Castleman explained that the molecules titanium monoxide, zirconium monoxide, and tungsten carbide are superatoms of nickel, palladium, and platinum, respectively. Superatoms are clusters of atoms that exhibit some property of elemental atoms. Former work in Castleman's lab has involved investigating the notion of superatoms. One of his previous experiments showed that a cluster of 13 aluminum atoms behaves like a single iodine atom. Adding a single electron to this aluminum-atom system results in the cluster behaving like a rare-gas atom. Further, he showed that a cluster of 14 aluminum atoms has a reactivity similar to an alkaline earth atom. Now, Castleman's new research takes the superatom idea to a new level and provides a sound quantitative foundation for the concept of superatoms. "It looks like we can predict which combinations of elemental atoms mimic other elemental atoms," he said. "For example, by looking at the periodic table, you can predict that titanium monoxide will be a superatom of nickel. Simply start at titanium, which has four outer-shell electrons, and move six elements to the right, because atomic oxygen possesses six outer-shell electrons. The element you end up on is nickel, whose 10 outer-shell electrons make it isoelectronic with the 10 outer-shell electron molecule resulting from the combination of titanium and oxygen. We thought this finding must be a curious coincidence, so we tried it with other atoms and we found that a pattern emerged." Castleman said that he doesn't know if the pattern will occur across the entire periodic table or if it will be confined to only a part of it. Right now, he and his team are working through the transition-metal atoms. In the future, they plan to take the research a step further to investigate whether or not the superatoms are chemically similar to their respective single atoms. "Platinum is used in nearly all catalytic converters in automobiles, but it is very expensive," said Castleman. "In contrast, tungsten carbide, which mimics platinum, is cheap. A significant amount of money can be saved if catalytic-converter manufacturers are able to use tungsten carbide instead of platinum. Likewise, palladium is used in certain combustion processes, yet it is mimicked by zirconium monoxide, which is less expensive by a factor of 500. Our new findings are exciting from both a scientific as well as a practical point of view."